An ordinary Indian club can be fixed so that different weights may be had without changing clubs. Each club is bored to receive lead washers which are held in place by a spiral spring. A bolt is run through from the handle end and fastened with a round nut. The lead washers and spring slip over the bolt as shown in the illustration. Changing the number of washers changes the weight of the club. --Contributed by Walter W. White, Denver, Colo. The holder is made of a round stick--a piece of a broom handle will do--as shown in Fig. 1. It is about 1 in. long with two notches cut out for the strands of the cord. These holders are easily made and will answer the purpose almost as well as the ones made in porcelain. Painting or enameling will improve not only their appearance, but also their insulating properties. Several of can be used along a line, as shown in Fig. 2. --Contributed by M. Musgrove, Boissevain, Man. 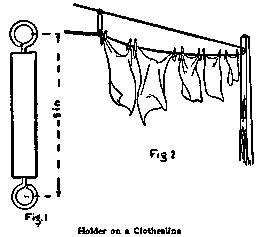 Anyone using a double clothesline over pulleys will find the arrangement shown in Fig. 1 for supporting the lower line quite convenient. The support is made of a piece of 3/4-in. square or round wood which has a screw-eye turned into each end. The line is run through these screw-eyes as shown in Fig. 2. --Contributed by W. W. Up-DeGraff, Fruitvale, Cal. Persons who wear noseglasses and who are troubled with excessive perspiration, should chalk the sides of the bridge of the nose before putting on the glasses. The latter will then never slip, even in the warmest weather. If the chalk shows, use a pink stick, which can be purchased from any art school or supply store. Gummed paper is a great convenience in the home especially for labels, but it is not always found among the household supplies. The gummed portions of unsealed envelopes in which circulars are received can be utilized for this purpose. Quite a large label may be made from these envelope flaps. If you wish to know whether or not the door or telephone bell rings during your absence, place a little rider of paper or cardboard on the clapper in such a way that it will be dislodged if the bell rings. 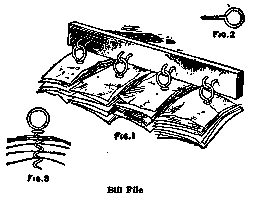 Single bills may be separated from the others and will remain separated as in Fig. 3. Contributed by James M. Kane, Doylestown, Pa. The metal required for making this stand is 3/16 in. in width and may be steel, brass or copper. The shaping is done as shown in Figs. 2 and 3. There are, in all, eight pieces to be bent. 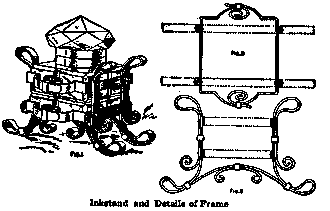 The two supports are each formed of one piece of metal with the exception that the end scroll pieces on the under side are made separately. Eight rivets are required to fasten the two horizontal rings to the supports. The glass receptacle can be purchased at a stationery store. Never guess the length of a piece of work--measure it. Glass letters are removed in the same way as metal letters, by applying caustic soda or potash around the edges of the letters. As the cement softens, manipulate the point of a pocket knife under the edges of the letter until the caustic works completely under and makes it easy to lift the letters. 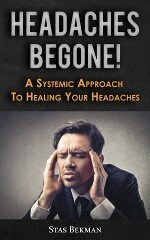 With care and patience, every letter may be thus taken off without breakage. Aluminum wire plunged hot into a cold solution of carbonate of soda becomes coated with a strong layer of oxide which forms an excellent insulator to electricity. The front wheel bearings of an automobile can be greased without removing the wheels in the following manner: Remove the hub caps and fill with heavy grease and then screw them in place. Continue this operation until the grease is forced between all the bearings and out through the small clearance on the opposite side of the wheels. This should be done at least once every month to keep bearings well lubricated and free from grit. Dirt cannot enter a well filled bearing as easily as muddy water can enter a dry bearing. --Contributed by Chas. E. Frary, Norwalk, O.